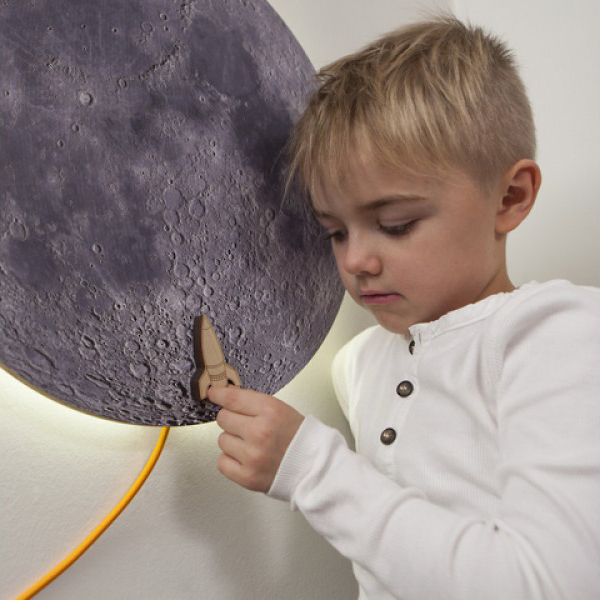 Moon note board by Kotonadesign is a wall lamp, a magnetic memory board and a chalkboard at the same time. The package includes a rocket magnet, that decreases the light amount about 70% when attached. When the rocket is removed, the light becomes bright again. 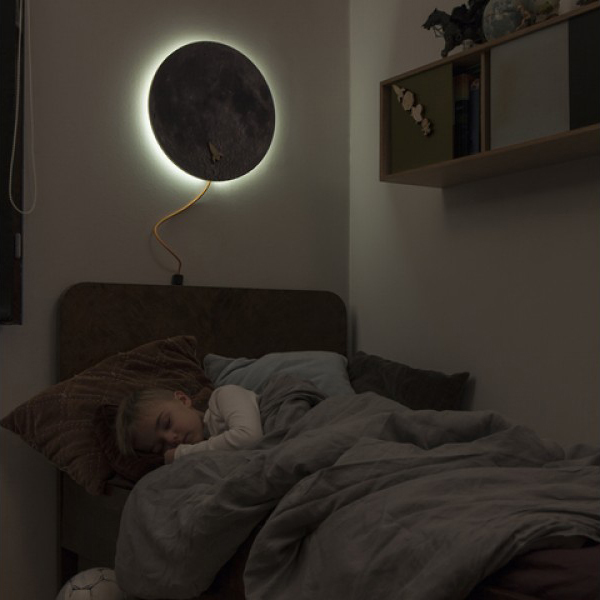 The Moon note board is perfect wall lamp in the nursery. Mia Battilana (b. 1968) is a Finnish designer who is also the founder of Kotonadesign, a Finnish trademark established in 2004 – Kotona is a Finnish word that means “at home”. The most innovative product designed by Mia Battilana is the original notice board which is at the same time a magnetic board and a whiteboard. Kotonadesign noteboards, available in different colours, shapes and sizes, are accompanied by a series of creative accessories. 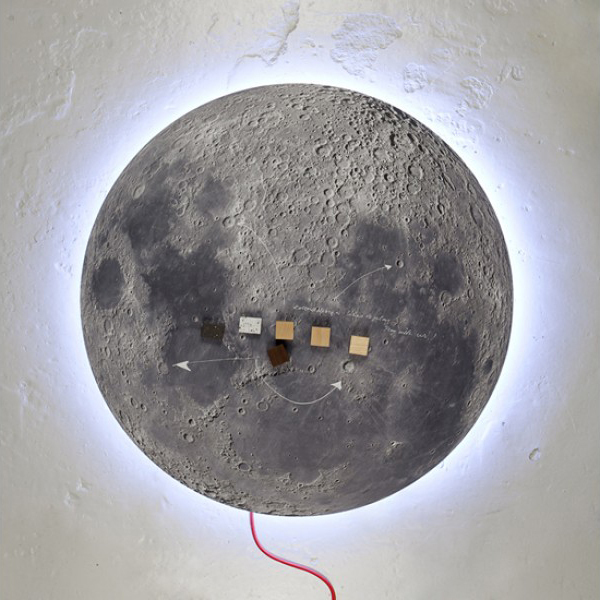 Mia Battilana’s noteboards have been shown in numerous exhibitions in many countries – including the exhibition “Nordic Design” in 2009 at the Total Museum of Contemporary Art, Seoul, Korea – and in short time the designer has become widely well-known for her creations. As for the origins of Kotonadesign, it all started from a left-over case in a workshop of a carpenter Mia Battilana knew. She was allowed to take with her as much left-over wood pieces as she would be able to carry. And of course she was able to carry a large amount of left-over wood pieces and once home she just sat admiring them and wondering. Wooden material which was meant to be burned found its way to useful products on refrigerator doors and notice boards This is how Kotonadesign’s product concept was born. 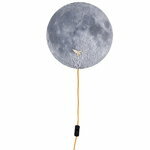 Kotonadesign realizes a series of original interior design articles that are perfect for decorating the house. Kotonadesign products go from coloured notice boards that are at the same time a magnetic board and a whiteboard to different kinds of magnets. All Kotonadesign products are made in Finland.